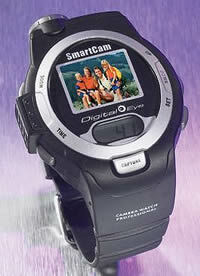 The lines between phones and digital cameras are being blurred, and the Digital Eye Wristwatch Camera is the next hot convergence gadget! It allows the user to take full color pictures in excellent resolution. With the included dock, you can store and display up to three dozen pictures and transfer them to your PC without any hassle.